INTEG will be at CinemaCon again this year! If you are going, please stop by and visit us at booth 2615A in the Augustus Ballroom. New for this year are some software updates as we continue to advance the JNIOR automation controller to handle more devices, more communication protocols and to be more robust than ever! We continue to expand our capability to control LED strip lights, LED down lamps and DMX devices and provide more ways to monitor temperature and humidity. Integrating the JNIOR with various third party systems such as Q-SYS, Barco, Dolby, Christie, etc. will be getting easier. Bruce, Kevin and I will be in our new booth. If you want to set-up an appointment to meet with us at the show, please reply to this email with a date and time good for you. This is the first use of our new email system for staying in contact with our customers. We will be using it to send notices about software updates, new products, etc. If you were added by mistake or do not want to be on the list, then please reply to this email and we will remove you immediately. If you know of anybody who would like to be added to our list, please forward this email to them so they can send me their contact information and approval. The JNIOR Control Panel is shipped with a ‘click’ sound that plays when a switch is pressed. This gives immediate feedback to the user that the panel has power and that the software is running normally and is ready to accept the press. There are times when the panel is used in a situation where the ‘click’ may not want to be heard. In this situation we may want to turn off that sound. The following application will accomplish this goal. To run this application you need to download it from the button and load it on your JNIOR. Applications are generally loaded in the flash directory. To run it simply type the command as you see it above. In the following code you will notice two classes. The main class of interest here is the ControlPanel class. This class will load the arguments into a ParameterGroup class so that we can process different commands at some point as well as there specific options. For now our command line is pretty simple but we set this application up for the future. private static final String USAGE_STRING = "CONTROLPANEL\n\n"
+ "  -VOLUME volume     Sets the volume level to a value between 0% and 100%\n"
Once the ParameterGroups class has been instantiated with our command line arguments we loop through each parameter group. When we find the “volume” parameter group we call processSetVolume() and pass in the parameter options. Now that we are inside the processSetVolume() method we need to validate the options provided. We make sure that a volume was provided and that it is a valid number between 0% and 100%. Now that the options have been validated and we processed the assigned volume we are ready to write to the connected control panels. We loop through each connected panel and check to make sure it is a Control Panel which is type 0xFA. If it is a Control Panel we can get the write block and send it to the Sensor Port. Got a MODBUS device that you want to publish its data to the cloud? Use the JNIOR and the MODBUS to MQTT application. MODBUS is a protocol that many legacy systems use. MQTT is new and works very well to publish data to any MQTT broker whether in the cloud or hosted locally. The JNIOR can fill the gap and get that older equipment’s data from the equipment to where you need it for analysis. If your slave is RS485 then you will need to use the model 410 and set up the serial settings to match your device. Once your setup is complete you will the the data update on the MODBUS to MQTT page. 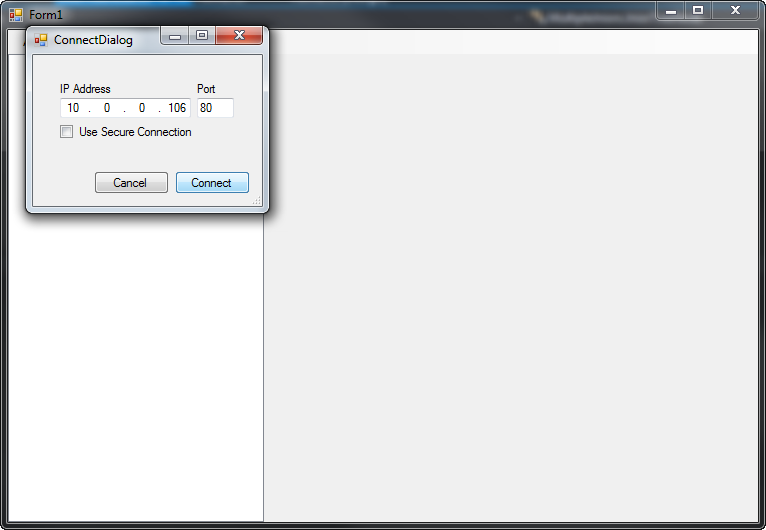 A message will be sent around the message pump the the MQTT application to publish the data. The data will be sent to the topic as follows with spaces in the slave name or data tag simply removed. This application is still a work in progress so please register to leave a comment below! Sometimes a JNIOR gets re-purposed. A JNIOR was performing one task and now it is going to perform a new one. You may want to clean up the JNIOR before configuring it for the new operation. In this case we will want to sanitize the JNIOR. To complete this task there will be two steps that will need to be performed. After confirmation the JNIOR will erase itself. It will be completely blank. Only the operating system will be present. All other software will be removed. The title says reset to factory but the OS will still be the currently loaded version and will not revert to the version that was shipped. The IP Address will also remain unaffected. All other user configuration including the hostname will be cleared. That leads into the second step. You will need to get the software package that you wish to install and update the unit with that code. Use the support tool and the Update tab to do this. Here is a great intro to MQTT. NOTE: This application is in development and screenshot may appear different when released. You can download the latest release here. Currently the MQTT functionality is limited but we are always looking for suggestions. Currently will publish IO status by default. 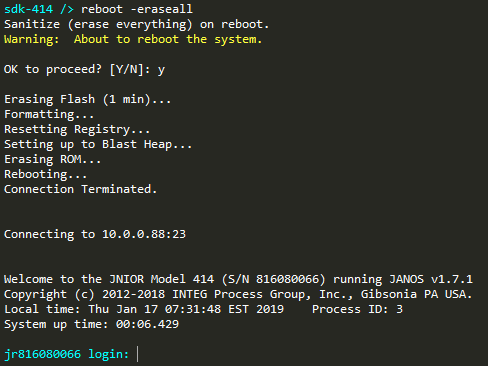 When the JNIOR boots up and successfully connects to a broker we will report the current status of the digital IO. Digital inputs will report state, usage meter and counter values. Relay outputs will report just state and usage meter values. To successfully connect to a broker you will need to have selected a broker and entered its information. Information such as the Host URL, port number and whether the connection should be encrypted. The JNIOR implements MQTT across a TCP connection. The default port number for MQTT is 1883 when non-secure connection while it is 8883 when using a secured connection. There are several public test brokers out there. Do not use any free broker for sensitive information. Brokers that require sign up will most likely provide a user name and password. There are two types of groups, Device Groups and Relay Output Groups. Both of these concepts are in BETA as of version 1.2 and we are looking for feedback. Device Groups allow JNIORs to subscribe to topics that contain the Device Group name instead of the Serial Number. A JNIOR can be part of one or many Device Groups. By default a JNIOR will subscribe to topics that are meant for it by Serial Number, for instance, jnior/618010001/set/... The JNIOR may want to be part of the pump stations group for example the JNIOR will subscribe to jnior/pumpstations/set/... topics. Relay Output Groups allow the specification of more than one relay to be affected at once. To set relay channel 1 you can publish the jnior/SERIAL_NUMBER/set/digital/outputs/1/state = true. But maybe you want channels 1 – 3 to be affected at once. To do this you will define a named Relay Output Group, “lights”, for example. Then, when the JNIOR receives the jnior/SERIAL_NUMBER/set/digital/outputs/lights/state topic all defined relays will change at once. You can enhance the MQTT implementation on the JNIOR with a custom application. Any topic that the JNIOR receives that is not part of our native implementation will be posted to the message pump for the consumption by another application. A custom application may also put topics with payload data to the message pump to be published by the MQTT application. This way the MQTT application performs the protocol logic while the custom application can worry about the logic. The JniorWebSocket Library was started as an example project. It has not had much use here in-house and therefore the testing has been limited. Here is a quick application that demonstrates how to instantiate multiple JNIOR WebSocket objects. Each Object is added to a tree control so that they may be interacted with individually. So far I have added the ability to add and remove, connect and disconnect and pulse output 1. This application can be easily extended to manage multiple JNIORs and perform many different tasks. Here are 2 links. The first is a link to the Visual Studio project for the library. The second link is a zip file containing the example described above. Here is a very simple example of how we can use websockets in a client browser to interact with the JNIOR. This example will demonstrate how to register a few event callbacks, connect, and display the messages that are received from the JNIOR. To force a monitor message to get sent we added an inversion checkbox for Digital Input 1. When the Inversion state changes the input acts as though an electrical signal has forced the state change. The WebSocket connection now behaves like any other bi-directional TCP Socket. All of the functionality of the JNIOR protocol has been implemented in the WebSocket protocol. The binary implementation has been replaced by JSON. This not only makes it easier to code and debug but it is more extensible. Below we have a zip file containing a demo page. The page shows the incoming JSON messages in the lower part of the page. The upper part of the page contains a button that will invert input 1 in software thus simulating the input receiving an electrical state change. // or comm object. The communication will be established to the device that serves this page. // a function to create a div with a timestamped message to the messages section of the page. // The div will be prepended so that is is at the top of the section. To run the demo simply place the downloaded .zip file in the flash/www folder on your JNIOR. Then open your browser and navigate to http://[IP_ADDRESS]/wsdemo. Using the zip file is taking advantage of another great feature of the JNIORs web server. A whole web application can be served out of a single zip file. This makes distribution and file management a lot easier. A watchdog timer (sometimes called a computer operating properly or COP timer, or simply a watchdog) is an electronic timer that is used to detect and recover from computer malfunctions. During normal operation, the computer regularly resets the watchdog timer to prevent it from elapsing, or “timing out”. If, due to a hardware fault or program error, the computer fails to reset the watchdog, the timer will elapse and generate a timeout signal. The timeout signal is used to initiate corrective action or actions. The corrective actions typically include placing the computer system in a safe state and restoring normal system operation. The sample below is very basic. You will need to adjust the duration and location of the watchdog for your application. // loop for 30 seconds. we will feed the watchdog in this loop. when the loop stops the watchdog will timeout and reboot the jnior. // now that the loop is finished. the unit will reboot soon. This is what we see in the log after the unit has come back up. Here are the options that are available to choose from when the watchdog expires. This is the default action. Expiration of the watchdog timer causes the unit to reboot. This action indicates that a watchdog timer expiration is to be handled by the application itself. The system takes no action. When the watchdog timer expires the system will terminate the application. This interrupts the current application (similar to Ctrl-C interruption) when the watchdog timer expires. When the watchdog timer expires this will interrupt the current application and restart it. When the watchdog timer expires a WM_WATCHDOG (0x11) message will be sent through the system message pump. The content contains the text associated with the watchdog. Watchdog timer expiration will notify the first thread in the application that is waiting for notification using waitOnWatchdogNotify(). This example will monitor the IO Log utilizing the IoLog class. There are many ways to watch IO for changes. You could simply poll the IO and see if it changes. You are likely to set up a polling routing on some interval. If that interval is not fast enough then you have the potential of missing an change. Using the IO Log ensures that you see that a transition occurred. You have the added benefit of getting the exact time of that transition to the millisecond. This helps if you are measuring the time between transitions. We can take the Message Pump sample one step further. We can incorporate real-time web page communication. The web server supports WebSockets. WebSockets allow for real-time bidirectional communication. We can leverage this feature and have these messages put on the Message Pump so that our Java application can get them. Our web page for the example looks like this. In the code we have a button handler that will send the json formatted message to the web server. // instantiate our websocket communications object and wire up some methods. lastly call connect! To accomplish this we created a class to handle the get-random-number request. We could have handled this in our Main class but hey I like modularity. We also had to modify our init() method to attach our MessagePumpHandler. Almost immediately upon clicking the button we get our response. As you can see here the web page gives you an amazing ability to communicate with a Java application in real-time. There are many times that you want to get a message from the system. You may also want to communicate between processes. To do either of these we employ the Message Pump. 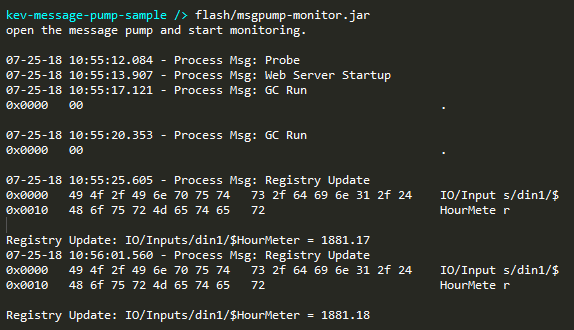 In this example we will monitor the messages that are going around the message pump inside the JNIOR. * A class that contains an enumeration of values for each message type. Not only does the above class define the types but it gives us a nice helper function to get a nice textual description for the message type. We will create a class that will monitor the message pump. The biggest note to observe is that we MUST forward the message once we receive it so that other processes can see the message. The message pump message delivery is also time sensitive. If we receive the message and perform a lengthy process before re-posting it the we could cause the system to assert as the message pump timing has been violated. * starts our message pump engine. When the above class receives a message from the message pump it will want to alert any listeners. Lets define the listener interface now. * An interface that outlines the method or methods that all classes that implement this interface must define. * A class to demonstrate the Message Pump feature in the JNIOR. * the QuickDateFormat() class is part of a library of classes and are beyond the scope of this example. // are daemon threads that would not keep the process from sxiting if this main thread completes. // Sometimes we might do somehting in this thread but for the sake of this example we have nothing to do. // use static methods to interface with it. // will be up to those llisteners to determine if it cares about the message. // so we have a message. what kind is it? // if there is data in the message then we should dump it so that we can see what it is. In the above lines 48 and 49 we add our listener classes. Line 48 is the this object representing the Main class. You can see what happens in the messageReceived() method starting at line 58. The other listener is the RegistryMessageHandler class. Here is the definition for that class. Each time a message is received from the message pump each of our listeners is notified. Each listener can check the message type to see if it cares about the message. A sample output from the application shows three interesting events. First, I opened the web page for the unit. The web server is NOT always running unless the web server port is accessed. Once the web server port was hit it caused the web server to spin up and send the Web Server Startup message. The next two events were registry updates. 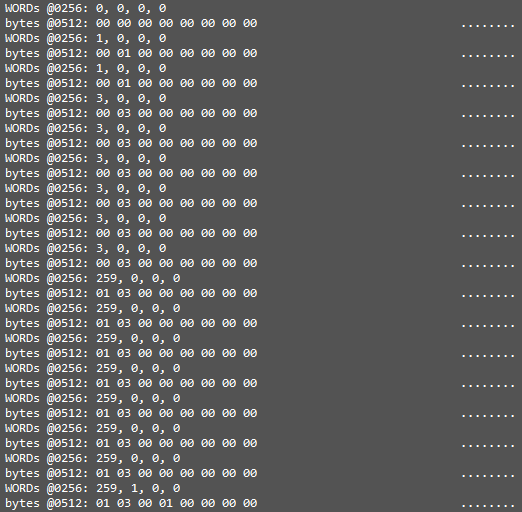 The Main class listener shows us that there was a Registry Update along with the HEX dump of the message payload. Then the RegistryMessageHandler listener used the registry key that was updated to get the new value. You can download the sample application JAR file below. This sample shows you how to read a barcode scanner using the AUX port. You must have the correct settings to communicate successfully with your device. The settings for the port may be set using the setSerialPortParams() method. This method can only be called after the port has been successfully opened. This sample requires that the MODBUS Server is running. This sample is meant to show you how to gain access to the MODBUS scratch memory space. You can see in the MODBUS manual that the MODBUS addressing assigns a “scratch” address space starting at WORD 256. Since WORDs are 2 bytes we know that the starting address is going to be 512. We can gain access to the “scratch” area by opening the Modbus00 immutable block. The Modbus00 immutable block does not exist until the MODBUS server has been started on the unit at least once in its lifetime. You can use the nv command to discover whether the Modbus00 block exists or not. If the Modbus00 block does not exist then execute the MODBUS Server. Once the MODBUS Server has been executed the Modbus00 will exist. The immutable example shown in the Immutable Class example uses an array of long values. We will use a byte array in this example. Here is some sample output from our application. We used a PC MODBUS client to adjust the values of the registers in the MODBUS scratch address space. You can see the values changing during the execution of our application. This sample shows you how to use the Immutable class. The immutable class represents persistent storage that can be accessed at the low level as an array of primitive types. This example shows the use of an array of longs. 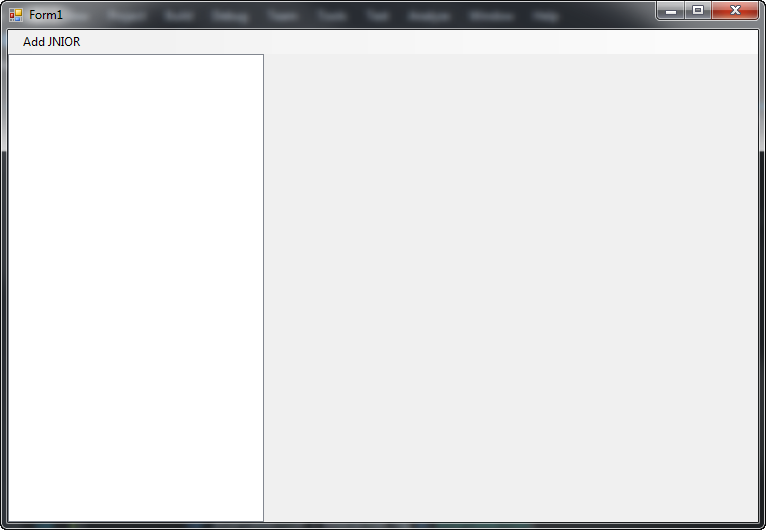 The long values in this application are date values that represent when the application was started. Sometimes it is vital to ensure that only one copy of an application is running. To do that JANOS has provided us the ability to register a process with the operating system. 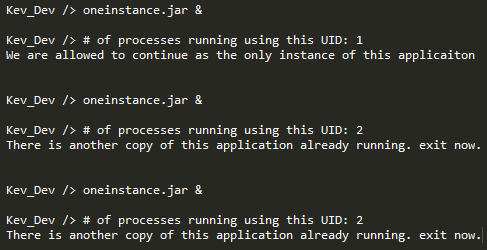 Using the registerProcess(uid) call we can get the number of processes running with the given unique identifer. This can become an issue if you have multiple run keys set to start the same application. Here is the demo application. The oneinstance application is started with the & parameter. 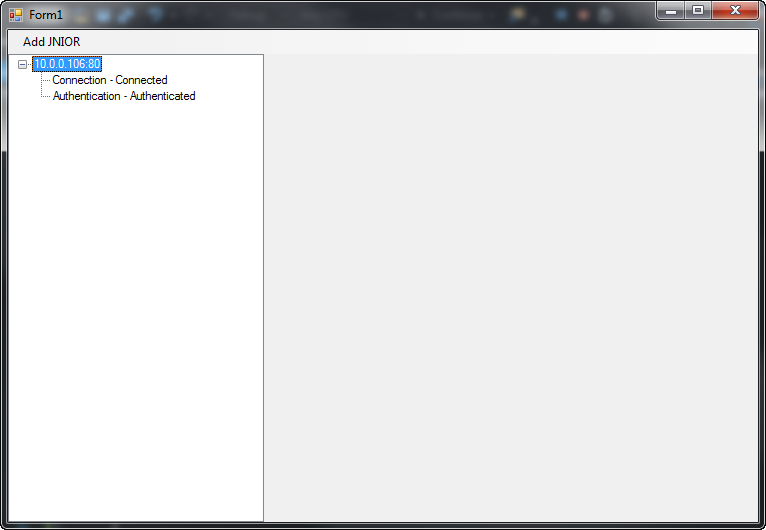 This tells the console session to run the application as a separate process. The First time the application run it returns a process count of 1. The process is allowed to proceed. Since the application is running as a separate process from the console session we can start another instance now. The returned count is now 2. The code checks for a count greater than 1 and decides to exit. Using this feature will help you be sure that there is only ever one instance of your application running at a time. Here is the source for the sample application. // we assign a unique identifier to this application. This can be ANY string. //  running with this uid. The result should be 1 indicating that our process is now running. 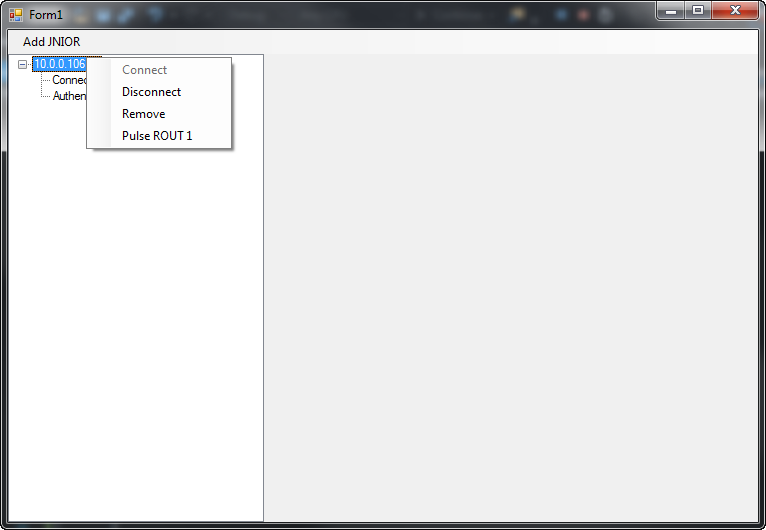 This sample shows you how to pulse multiple outputs and a single output. The method must take two binary masks. One describing the desired states durring the pulse and the other describing which channels will be pulsed. //print the Output States through telnet (console) connection. //Pulse 8 Relay Outputs On for 5 seconds (5000 milliseconds) after which outputs will return to previous state. //Sleep 10 seconds to so that there is a noticable difference between on and off states. //Pulse Channel 5 Relay Output On for 5 seconds (5000 milliseconds) after which output will return to previous state. The classic Hello World application that runs on the JNIOR! //set output relay for channel 5 (channel n-1) and true top turn the relay on, false to turn relay off. //Relay Output 5 should now be on.